Just as I was getting comfortable with Facebook, Google launched its own social network called Google+. I've experimented with it for a couple of weeks now and think it could be the next big thing. I am especially excited about its Circles and Hangouts features. One thing I have not liked about Facebook is that if I want to write a post about genealogy, that post goes to ALL of my friends - friends from high school, church, acquaintances, friends I didn't know were my friends, etc. Google+'s implementation of circles solves that. When I want to post a message for my genealogy friends, I simply add the Genealogy Circle (in blue below). If I only want to read posts from my Genealogy circle, I just click on its category in the Stream section on the left, and now I can read posts from my genealogy friends. Hangouts are really cool! Hangouts are where you and up to nine others can be in a video call all at the same time. You can see and hear everyone else. Whoever is talking automatically appears in the larger video screen. All you have to do is have a webcam, Internet connection, and your Google+ account. You can hang out with everyone in your family circle and have a mini family reunion. Or hangout with other genealogists. One of my circles is a Legacy Employees circle - we did a hangout this morning with me, Dave (president), Ken (vice-president), and Luc (developer). It's a great way to communicate when you're not all in the same office. One thing I wish it would do is let me share my screen with others. I'll have to stick with my GoToMeeting.com account for the time being. Best of all - hangouts are free. If you don't yet have a Google+ Account, visit http://plus.google.com. You will have to create a free Google account to join. I think accounts are now open to the public, but if not, send me an email and I'll send you an invitation. For a great overview of Google+, view the Google+ Start-Up Guide here. When you get there, just click on the big slide, and to advance to the next slide, just click. Those of you with a Google+ account, what do you think? Is it going to catch on? Let's say you have a picture of two people together. You attach the photo to the first person and fill in the caption, date, and description. Is there any way to copy and paste it to the other person so that you don't have to fill out all that stuff again? Right-click on the picture and click on Copy. Next, open the other person's Picture Gallery, and in one of the blank spaces, right-click and click Paste from Legacy clipboard. Your picture is now linked to both individuals. Personally, in this case I would link this "couple" picture to their marriage. Then I would open my picture editor software to make a copy of the original (using its Save As command). Using the Crop tool, I would then make two pictures out of it - one for each person. Then, back in Legacy, I would link these individual pictures to each person. Doing so would give me a nice picture pedigree. Just be sure to make a copy of the original before doing any cropping. There are a lot of other ways we could go with this discussion, maybe we ought to do a webinar about it? What do you think? Any other ideas out there about this topic? Wednesday's webinar - Google Images and Beyond - door prizes, etc. I just completed my "practice session" with Maureen Taylor (making sure the audio/video connections are working well) and she showed me some of the things she will be demonstrating in tomorrow's Google Images and Beyond webinar. I was blown away with what she showed me, and you will be too. 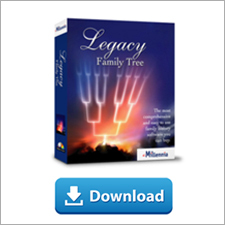 If you haven't yet registered for this free webinar, do so at www.LegacyFamilyTree.com/webinars.asp. Be sure to join at least 15-20 minutes early tomorrow to ensure that you are one of the first 1,000 to attend. I'm also hoping to "open up the mics" for the Q/A session at the end, so if you have a headset or microphone, and you want to ask your question live, you'll be able to. I'm going to open the webinar about 15 minutes early so those who want to test their microphones can (DearMYRTLE did this in her Google+ workshop webinar I attended this weekend - great idea Myrt!). If you want to test your mic, I will ask you to click on the "hand-raising" button, and I will then open your mic for the test. We've got another great collection of door prizes that we'll be giving away. All you have to do is be present during the live session to be eligible to win. Of course, we will also have our traditional webinar coupon code too. Most genealogists have heard a little about how genetic testing can help prove, verify, or even disprove a pedigree or difficult research problem. 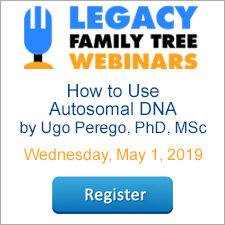 Thanks to Dr. Ugo A. Perego's webinar yesterday, we all now know a lot more about what to expect from a DNA test. And thanks to a new partnership we've recently made with Sorenson Molecular Genealogy Foundation and GeneTree.com, these DNA kits are now available to purchase from our online store. Testing your Y-DNA is an ideal way to learn more about your direct paternal line (the lineage connecting you to your father, your father to his father, and so on). You receive your Y-DNA profile of 46 markers and a Y-DNA haplogroup prediction. Use your haplogroup prediction to discover the early origins and migrations of your paternal ancestors. Use your Y-DNA profile to find DNA cousins in GeneTree’s genetic-genealogy database. Any person you find with a matching Y-DNA profile is your paternal relative, some distant, some recent. By contacting and collaborating with your DNA matches, you can investigate, verify, and discover more information about your paternal line. This test is available to males only. Price: $179. Testing your mtDNA is an ideal way to learn more about your direct maternal line (the lineage connecting you to your mother, your mother to her mother, and so on). You receive your mtDNA profile and mtDNA haplogroup prediction. Use your haplogroup prediction to discover the early origins and migrations of your maternal ancestors. Use your mtDNA profile to find DNA cousins in GeneTree’s genetic-genealogy database. Any person you find with a matching mtDNA profile is your maternal relative, some distant, some recent. By contacting and collaborating with your DNA matches, you can investigate, verify, and discover more information about your maternal line. This test is available to males and females. Price: $179. Is Griffin Brown part of MY family? Some of you think I talk about my Brown families too much. I probably do, but I've learned more about genealogy by studying the Browns then by any other way. And now I hope to use DNA testing to solve a brick wall. Asa Brown had four known children by his first wife, Elizabeth. I know who children two and four are, but children one and three are still a mystery. I believe that child three is Griffin Brown, but have not yet proved it. The way I see it, I have two choices. First, I can continue with traditional research methods to prove or disprove his position in the family or second, I can use genetic testing to prove or disprove his position in the family. Let's say that through genetic testing I learn that Griffin does NOT belong to the family. Case closed. Now I can use my resources to try to find the real child number three. I suspect, however, that the tests will show that Griffin does belong to the family. So while the price of a DNA test seems a bit high, it could save me years (and hundreds or thousands of dollars) of chasing after the wrong guy. So this is my plan. I need to identify a living, male, Brown descendant of either child #2 (Nathan ) or child #4 (Lorenzo) and have his Y-DNA tested. Then I would compare that DNA with that of a living, male, Brown descendant of child #3 (Griffin). If the DNA matches up, then I know that Griffin does in fact belong. Make sense? I'll let you know what I learn. And if you see a guy dancing in the street, it just might be me doing my latest Genealogy Happy Dance. Google Calendar has changed my life. I have access to my day's events on my computer, cell phone, and my refrigerator. And because both my wife and I have shared our Google Calendars with each other, we have access to each other's events. When she adds an event to her calendar, it also shows up on mine. At any time, I can hide her calendar from mine so I am once again just seeing my events. When I am at the ball game, and my son's coach announces the time/place of his next practice, I pull out my cell phone, add the event, and it is instantly available on our calendars at home. Learn more about Google Calendar at http://calendar.google.com. Notice that I have three calendars: Geoff's (me), Tanya's (my wife), and the webinars calendar. I can display the events of one, two, or all three at the same time just by clicking on the calendar's name. It is very simple. We invite you to add our Legacy Family Tree Webinars calendar to your Google calendar. When we add a new event to our calendar, it will automatically show up on yours, as long as you are displaying it in your Google calendar. Give it a try and let us know what you think.